The IT infrastructure and the tools used and offered by MCI have a significant environmental footprint. The digitisation of our infrastructure and the services we offer presents one of the biggest opportunities for MCI to significantly improve the waste and energy impacts from our events, our business productivity and client value proposition. In 2017 we have continued our ambitious process of “walking into the cloud”, migrating and outsourcing MCI’s servers to a Cloud-based infrastructure to considerably reduce our environmental footprint. Our data is hosted in Microsoft and Interoute data centres which have both implemented sustainable technologies and solutions that significantly increase energy efficiency while reducing the CO2 consumption of their data centres. Ultimately, our goal is that MCI will no longer have to maintain an energy-sapping IT environment. Teamed with MCI’s renewable energy and offsetting commitments, we aim to continuously reduce our IT footprint. MCI upgraded the majority of IT equipment. New machines are highly efficient and eco-labelled where possible, and the replaced equipment recycled. We are currently working on the implementation of new telephony and videoconferencing solutions for inter offices collaboration, reducing travel needs. Together with Dorier, our Audio Visual and production business unit, we are systematically incorporating sustainability thinking into our day to day operations and the services that we offer our clients. There is an increasing volume of technology available to help event organisers meet sustainability objectives, and we are continually innovating, and on the search to find new solutions that can help our clients to engage and activate their audiences, while reducing the carbon and waste footprint of their events. One such example is multi-site event technology. Deployed to more than one region, multi-site event technology makes it possible to send one unifying message across all sites while enabling virtual interactions in real time. Making a careful choice of “hub” locations means that we can offer an alternative to participants, that can reduce carbon emissions and considerably shorten their travel time. Another example is Stage mapping projection. This is a projection technology used to turn objects into a display surface for video projection. Instead of building large scale stage sets and sponsor advertising, there are fantastic technological tools that can light up huge buildings, stage sets, and event spaces. Mapping has become a regular feature for places like the Sydney Opera House or the Houses of Parliament in London. 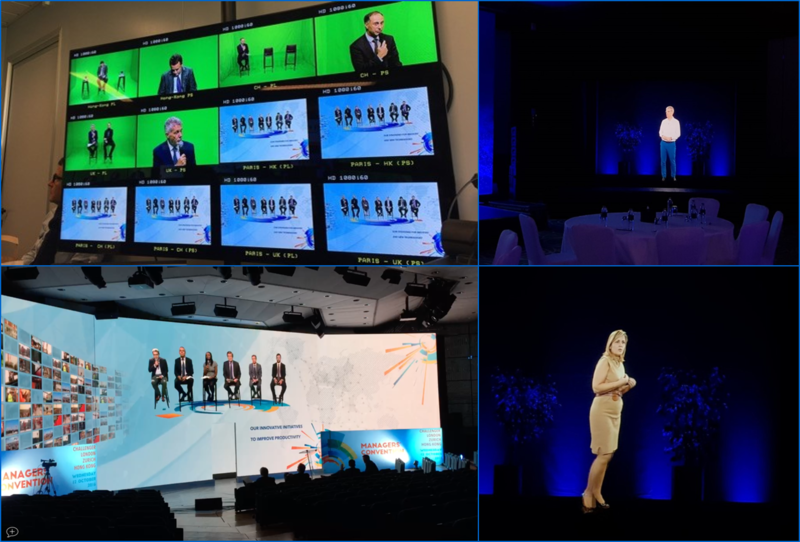 However, our production team excels at adapting the 3D Mapping solutions to light up brand experience, conferences, product launch or gala dinner. Finally, hologram technology or green box inlay can now beam speakers onto stage, live or pre-recorded to deliver an innovative and engaging speech that wows audience while considerably reducing carbon emissions.